About once a year or so, I take out my ice cream maker and use it obsessively for a couple weeks, before storing it away and not thinking about making ice cream again for months and months and months. 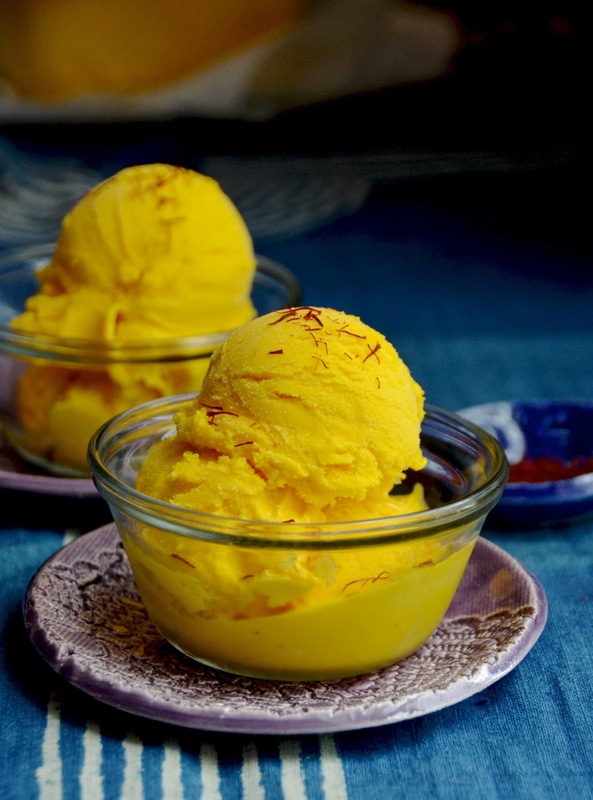 This years binge resulted in a few batches of sorbet (like this Simple Cantaloupe Sorbet), a straightforward mango ice cream (for Eugene, who prefers his ice creams straightforward), and this very NOT straightforward Mango Saffron Ginger Ice Cream for myself. 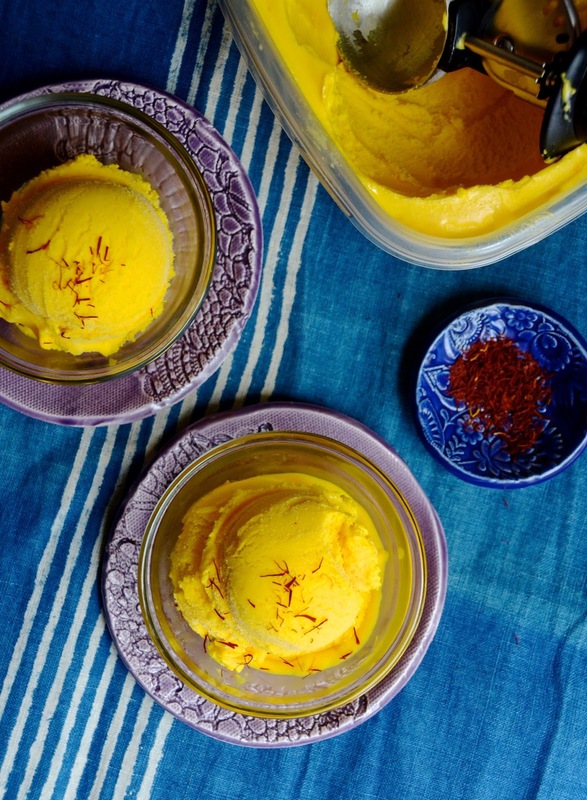 I've always loved the taste of saffron in sweets. It's the flavor base for one of my favorite cakes (this Blackberry Saffron Almond Cake) and also shows up in a bunch of other desserts on here (like this Saffron Walnut Cake and this Chocolate Chip Fig Cake). It's musky and floral and works beautifully with fruit. Whenever I serve something with saffron in it, I find that people don't always know immediately what the flavor is, but they (generally!) enjoy it. And it of course works particularly well with mangoes and ginger. The combination is hardly a new one as it's quite popular throughout many parts of the world. 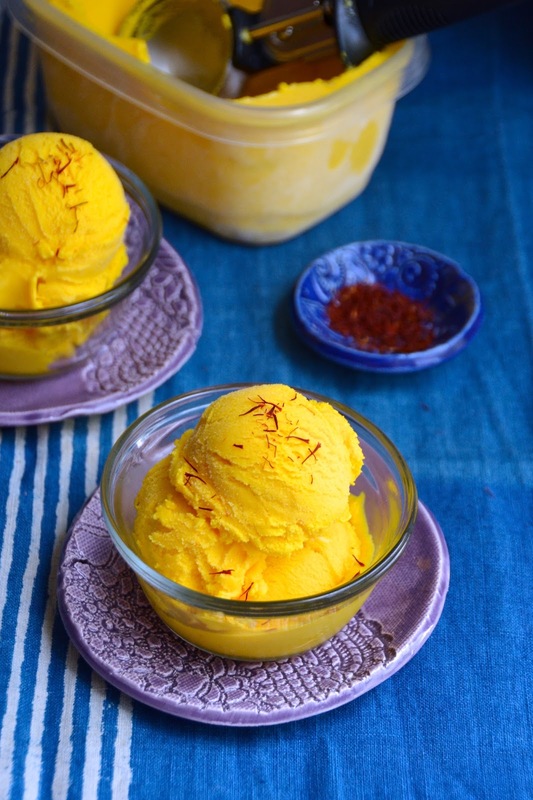 And the bright yellow color from the saffron and the mango is absolutely stunning. This would be a lovely dinner party dessert, either on its own or paired with a thick slice of olive oil cake. Note that you DO need an ice cream maker for this recipe, but it doesn't have to be anything fancy. I've been using this same inexpensive ice cream maker for years and it's still my fave! Peel the mangoes, and cut the fruit into large chunks. In a small saucepan over low heat, combine the cream, milk, sugar, and saffron, and cook, stirring occasionally until the sugar is dissolved. Remove from heat and let cool completely to room temperature. In a blender, combine the cooled cream mixture with the diced mangoes, salt, and the ginger, and puree 3-5 minutes, until smooth. Place a fine mesh sieve over a large bowl and strain mango puree through to remove any fibers or solids. Discard the solids and pour the strained puree into your ice cream maker. Freeze according to manufacturers instructions. Transfer to an air-tight container and freeze for an additional 4 hours before serving.